undesirable behaviour such as digging, chewing and excessive barking. Canine sports provide a healthy outlet for a dog's energy - plus it's a lot of fun! As per all of our courses and classes, we do not offer KUSA gradings. We are a training school and hence provide the training for the handler and dog to be able to enter such KUSA events if they so wish. Our gradings are conducted in-house for two reasons: a) to ensure that evaluations are as consistent as possible, which helps us to refine the syllabus and ensure that the value from your training time is maximised, and b) to ensure that people do not feel forced into competitive sports which they may have no interest in. We are more than happy to provide a formal letter stating which levels have been completed at McKaynine should the handler require this. If a handler would like to grade for any discipline both at McKaynine and at KUSA shows, we are happy to provide details of upcoming KUSA shows. Entry at the KUSA shows is typically just for grading i.e. it does not include any training. Handlers wishing to enter KUSA shows must please consult the KUSA website with regard to requirements, show dates, entries etc (www.kusa.co.za). 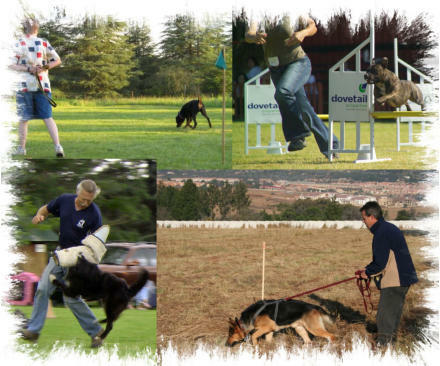 Agility handlers are also encouraged to view the SADAA website for additional registration and show events (www.sadaa.co.za). digging, chewing and excessive barking. energy - plus it's a lot of fun!